Many people asked me why I was applying, and later, why I was going, to the London International Youth Science Forum (LIYSF), when I would miss weeks of school – which seemed critical as the forum was to be held just weeks from our final exams. Not to mention all of the fundraising that needed to be done to be able to make such a trip possible. It seemed too hard; that there wasn’t enough time or money. It seemed impossible. Why would I go on the forum? What would I get out of it? Now I can say confidently however, that the lessons, friends, knowledge and skills that I gained from LIYSF far outweighs any of the obstacles that needed to be overcome in getting there. LIYSF was, and still is, the greatest experience of my life, and I’m sure it’ll be one that is hard to beat in years to come. LIYSF is a 2 week residential event held at Imperial College London, bringing together 425 people from 64 countries with lectures and demonstrations from leading scientists, visits to world class research centres, scientific institutions and organisations, including the finest laboratories and universities in the United Kingdom, as well as the opportunity to meet renowned scientists from all over the world. From the beginning of the opening ceremony the forum highlighted the importance of collaboration between global scientists in every field of science – it’s this way of thinking which will ensure that science continues to have a big impact upon society, a mentality which was captured by the forum. Over the next two weeks, we attended some incredible lectures, from some of the world’s leaders in science, and visited some of the most exclusive and prestigious research laboratories and industries in the United Kingdom. From Oxford to Cambridge, to Airbus and Rolls Royce, and from Cancer Treatment Centres and Wetland Conservation Departments, to Space Laboratories and Pharmaceutical Companies, these exclusive visits gave us a deep insight into the broad, challenging, and exciting life of a scientist which extends far beyond the research lab. Whether they examine fibre optics or medicine, particle physics or even the structure of some of the world’s tallest buildings, the distinguished scientific leaders gave engaging and unique lectures that allowed me to uncover newfound passions across various disciplines. In no other program can such a gathering of people from all countries who so strongly share a common love for science be found. The forum has thoroughly inspired me and will undoubtedly continue to serve as a compelling influence on my life. The tailored academic program allowed me to quench my thirst for physics and mathematics, whether that be through receiving an exclusive tour of Oxford’s Physics Department, or by visiting the Mullard Space Laboratory in Surrey, where I attended lectures on astrophysics, rocketry projects and launches available for high school and uni students, and “galactic archaeology”, as well as have a small taste of many other fields of science that I barely knew existed. One lecture that resonated with me in particular was that of Professor Murray Shanahan of the Department of Computing from the Imperial College London. His work was attempting to model the human brain more effectively using computers, which would thus allow for the creation of an artificial intelligence. It is argued however, that because his work involves attempting to perfectly simulate the electrical currents of the brain into computer signals, that instead of forming an entirely new “brain”, he would be simply recreating, or cloning, the brain – the memories, the emotions, and the thought processes, of the original subject. Neither neuroscience nor computational science were fields that had ever interested me previously. However I walked away from that controversial, and intriguing lecture, wanting to explore the field, and science, further. LIYSF also had an equally extensive social program that aimed to broaden student horizons of different cultures, and get us thinking beyond ourselves and our countries. When you meet someone from a place you’ve never heard of before, with a name you can’t pronounce, and they dress differently to you, and have a different faith to you, there is simply nothing more humbling then being able to connect with them over science – it’s indescribable. The forum’s social program included the “International Cabaret”, a talent night where students performed to the rest of the forum. It was quite incredible to meet people who were so “real”, so “normal” and like youth back home in Australia, and then to see them have an amazing talent such as singing or dancing, to hear of their amazing achievements, yet all being intertwined with their passion for science – it itself was quite awe-inspiring too. The “Traditions of Home” night also allowed students to showcase their culture and their country, and included traditional songs and dances, while wearing traditional dress, and even the opportunity to taste the traditional food of many countries; we Aussies brought along Tim Tams and Vegemite! 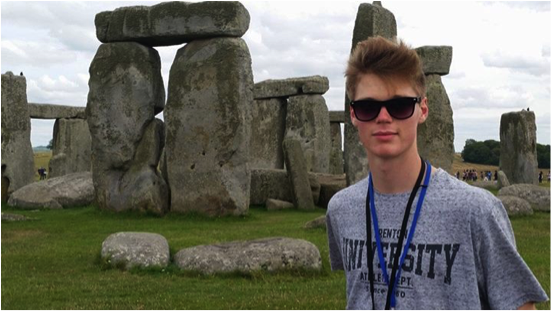 I was really thankful for the extensive optional programs that the forum ran, allowing us to do some worthwhile sightseeing, and visit places such as Stonehenge, Buckingham Palace and the London Eye. Being my first time overseas, I really tried to absorb every opportunity that the forum presented, and I have fond memories of running through the streets of London with my new friends from around the world, trying to make it to the West End Theatre on time, or being amazed by the immense gravitas that places like Stonehenge and Westminster Abbey possess. 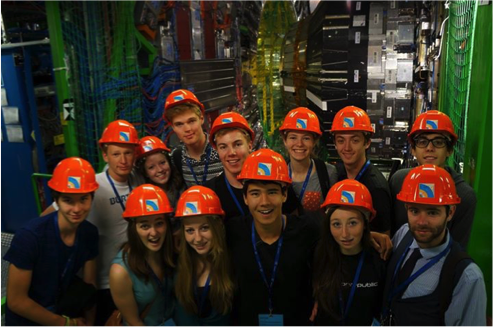 The main program of the LIYSF was followed by the optional CERN trip to Paris and Geneva, to visit various science institutes and museums, including CERN, a global organisation seen as the world’s pioneers in science. It is also home to the Large Hadron Collider – the world’s largest particle accelerator located hundreds of metres below Geneva. At 27 km in circumference and crossing into France and Switzerland, it accelerates particles to 99.9% the speed of light to recreate the conditions of the Big Bang. The CERN program was definitely a highlight of the forum. After spending several days in Paris sightseeing, we then crossed the French-Swiss border into Geneva where we stood on holy ground – CERN and the LHC seen as the “holy grail” of science. For me personally, it was simply surreal to be at a place that I had only seen and heard so much about in books and on tv; I remember doing an assignment when I was 13 on the Large Hadron Collider. Never did I imagine that I’d one day actually see the LHC in person. 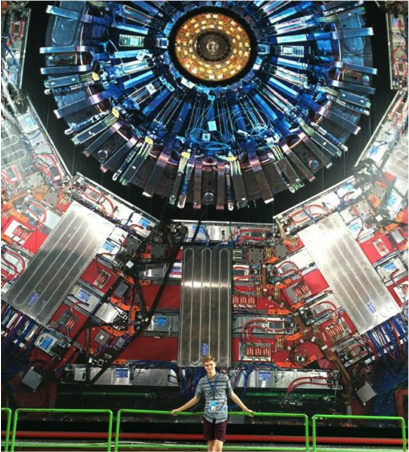 A photo of me in front of the CMS Detector at the LHC at CERN. LIYSF was a big eye-opener. An eye-opener to different cultures, places and people. The greatest eye-opener for me however was being able to see what other young people are doing around the world. One of the components of the forum was the “Student Bazaar”, where the participants of the forum were able to showcase their research projects, which for some, was what had won them a spot on the forum. From breakthroughs revealing fruit peels that can hold the cure for cancer, to creating their own biodegradable nano-tube water filters, to discovering bacteria that can double the rate of growth, and the yield of crops, the calibre of young people at LIYSF was extraordinary. It inspired me to not only pursue my own research endeavours, but to encourage young people back home in Australia to do the same. To describe my LIYSF experience in one word: overwhelming. Being a kid from a little country town, it was simply overwhelming to be exposed to so many young people with a passion for science, each bringing their diversities and differences to the forum. It’s the combination of this diversity with the high level of interaction between the participants and the lecturers and researchers that sets the LIYSF apart from anything else in the world. A group of us hundreds of metres below the ground at the CMS Detector of the LHC. For me personally, I found that LIYSF not only confirmed my love for science, but also stressed upon me that science is such a global field, and that it can truly take you anywhere. I know from LIYSF that I would much rather work on making science far more relevant to the public, working with people, rather than devote my entire life to research. LIYSF was an amazing experience, and I would highly recommend it to other students, as I can only hope future students are as fortunate as I am to experience the absolute privilege of attending the London International Youth Science Forum. The LIYSF has made a huge impact upon me, and the lessons that I learnt will undoubtedly be something that I carry with me not only in my studies of Year 12 and university, but also in life after the forum.